Yesterday Christopher Walken's Dead Zone (1983) movie was on TV; the one about him waking up with psychic powers after 5 years in a coma. The Martin Sheen character so much reminds people of both Hitler and now Donald Trump, that it sends a shiver down peoples spines. If you haven't seen it lately, check it out! Calaveras County will announce LAYOFFS soon!!! We have been told that due to the end of the cannabis growing in Calaveras County, that many people will be laid off at the county offices. Also, local business people, hardware stores who service cannabis farms needs, will be laying off, along with restaurants, markets and other businesses they had been supporting. Be ready for another RECESSION!!! February 6, 2017 at 10 AM: A pickup has reportedly rolled over on Hwy 4 between Cottage Springs and Camp Connell. A tow truck is en route to the scene. No injuries have been indicated. Be extra cautious as the roads are slippery. Melissa McCarthy made a surprise appearance on SNL this weekend. She appeared as a pretty slick Sean Spicer, and he didn't like it much. She was right on with her imitation, though. Sometimes he would like to throw the podium at some media reps, it seems. She was great!! On February 5, 2017 Angels Camp Police arrested Cody Alan Agasihorn (28) of Angels Camp on North Main Street. Agasihorn was booked into the Calaveras County Jail for alleged Manufacturing, Importing, Sales or possession of Metal Knuckles, a felony and for Possession of a Controlled Substance and Displaying False Registration, both misdemeanors. Macedo and DiBasilio can't stop!! Both temporary Sheriff DiBasilio, (who wants to be known as Ranger Rick) and Captain Macedo (the AX MAN) bash all cannabis growers and users as CRIMINALS!! 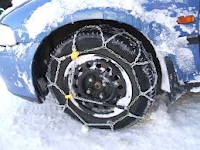 February 6, 2017 at 9 AM: Chains are now required on vehicles without 4 wheel drive at Cottage Springs on Hwy 4. Lower, the rain is creating wet and slick roadways, so drive carefully. Can we hitch a ride SOUTH?? 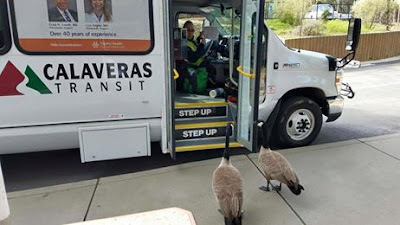 Calaveras Transit is gaining passengers, at least if they allow geese to ride! What we have all suspected ever since Trump took over the Oval Office is that since he is not very smart, that someone in running things for him. SNL got it smack on the head. Steve Bannon is the real President of the USA. Trump just does what he tells him.